Hello! 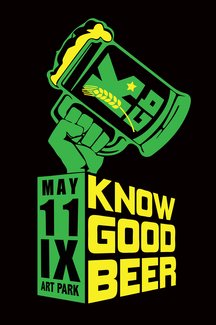 The 6th annual KGB Spring Fest is on May 11th from 12-5pm at the IX Art Park in Charlottesville. Volunteers are essential to the success of our events and we want you to enjoy the experience. Each volunteer will receive free entry to the event, a tasting wristband and glass, a Comrade shirt, and pizza. You may also bring a growler with you to fill up at the end of the event and take home. We are only doing one shift for this event but plan to have enough roaming volunteers so that everyone will get a 30-45 minute break and be able to sample the beer. If you are interested in working the ENTRY or working SITE OPERATIONS instead of pouring beer please indicate that on your sign up. These are key positions that we want to fill with trusted volunteers! IMPORTANT: each volunteer must sign up as an individual (even though the system allows you to select more than one). If you have a friend, spouse, etc, who also wants to volunteer, he/she must sign up separately. The name listed on the signup must match your government issued ID. No drinking behind the table (this is a Virginia ABC law). DO NOT leave your table and taps unattended. You cannot be intoxicated during your volunteer shift. Please bring a valid ID with you to the event. Be on time. We will have a brief volunteer meeting at 11:15. VIP entry is at NOON, General Admission at 1pm, last call at 4:45pm, event ends at 5pm. Have reliable friends? Invite them to volunteer. Spots fill up fast! Near Olivia Sabik if possible - thanks! Same as previous years works for me! Bourbon area works, or wherever needed. With/near Josiah Slaydon if possible. Thanks! Would like to work with/near Jesse Mlcoch if possible please! Thanks! Please put me with Evan Shafer! Paired with Cody Miller if possible! Please pair with Josiah if possible. Thanks!